Mangaluru Oct 12, 2016: The most awaited Tulu Movie ’Barsa’ is set to be released on October 13, Thursday.. Barsa is an action packed family entertainer. Arjun Kapikad and debutant Kshama Shetty have played the lead role in the movie, informed Director Devdaas Kapikad. 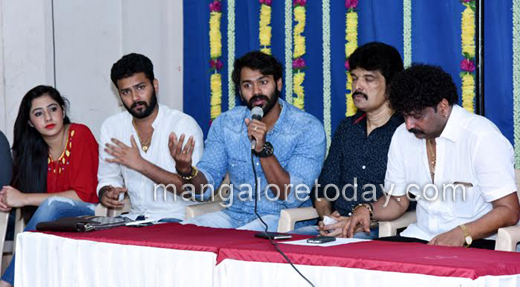 Addressing Media at Suma Sadan Hall near Mallikatte on October 12, Wednesday he said that, the film is produced under the banner of Bolli films. Barsa movie is going to be family entertainer with comedy sequences, action and drama. Barsa movie has also secured U Certificate from the Censor Board. The movie will be released in Suchitra Theatre in Mangaluru as well as theatres in Karkala, Moodabidire apart from four multiplexes in Mangaluru and Manipal. The movie will be also released in USA and London, he said. The movie also features Bhojaraj Vamanjoor, Aravind Bolar, Sathish Bandale, Laxman Kumar Mallur, Sarojini Shetty, Suresh Kulal and others. The film is directed by Devadas Kapikaad, Produced by Sharmila D Kapikaad, Mukesh Hegde and Sapna Srinivas Kini. Manikanth Kadri has scored the music. Cinematographer PL Ravi has captured the scenes. Devadas Kapikad has written and composed the songs of Barsa and even sung two songs in it. Actor Arjun Kapikad, Actress Kshama Shetty. Producers Sharmila D Kapikad, Sapna Srinivas Kini and others were present.